Fill a saucer with fresh peaches, finely sliced, or strawberries, carefully picked and selected; over this, place a measure of ice-cream, vanilla flavor. Cover all with powdered sugar to the depth of one-fourth inch. Eat with spoon (if your income is over twenty thousand dollars, you can use a strawberry fork). Serve with angels food, or almond macaroons. 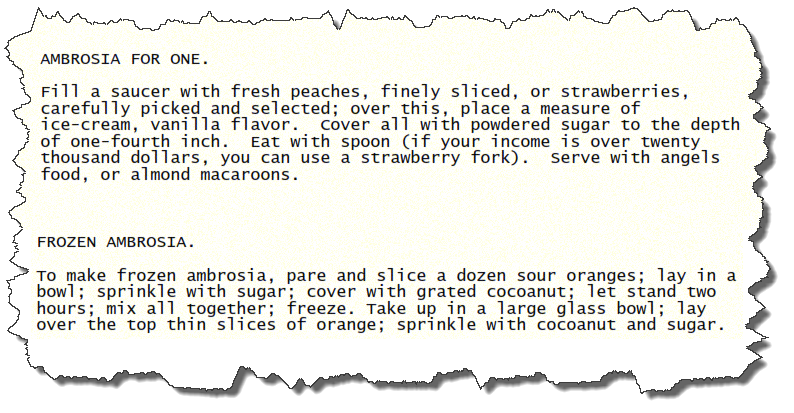 To make frozen ambrosia, pare and slice a dozen sour oranges; lay in a bowl; sprinkle with sugar; cover with grated cocoanut; let stand two hours; mix all together; freeze. Take up in a large glass bowl; lay over the top thin slices of orange; sprinkle with cocoanut and sugar.